Republican Sen. Jeff Flake on Tuesday bashed Supreme Court nominee Brett Kavanaugh’s recent performance before the Senate Judiciary Committee, suggesting he doesn’t have the temperament to sit on the nation’s highest court. Flake didn’t elaborate on whether he would still vote to confirm Kavanaugh. Flake described Kavanaugh’s interactions with senators during a hearing last week about sexual assault allegations against him as “sharp and partisan,” according to The Atlantic. “We can’t have that on the Supreme Court,” Flake added. Flake, who sits on the Senate Judiciary Committee, did not say whether this meant he would not vote to confirm Kavanaugh later this week when his nomination is considered on the Senate floor. During his emotional, fiery testimony last Thursday, Kavanaugh repeatedly attacked Senate Democrats and accused them of attempting to derail his nomination to get “revenge” for former Democratic presidential nominee Hillary Clinton’s loss in the 2016 election. 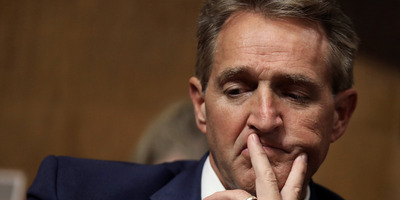 The day after the dramatic hearing, a visibly anguished Flake urged his fellow senators to support a weeklong FBI investigation into the allegations against Kavanaugh before a Senate floor vote. Senate Republicans and the White House ultimately agreed to the investigation, which is ongoing. Meanwhile, Senate Majority Leader Mitch McConnell has repeatedly stated that a vote on Kavanaugh’s nomination will be held this week.